Regular meeting day is the first Saturday of the month at the Midwest Electric meeting room in Grant. We meet at 9:00 a.m. MT unless otherwise noted on the calendar. 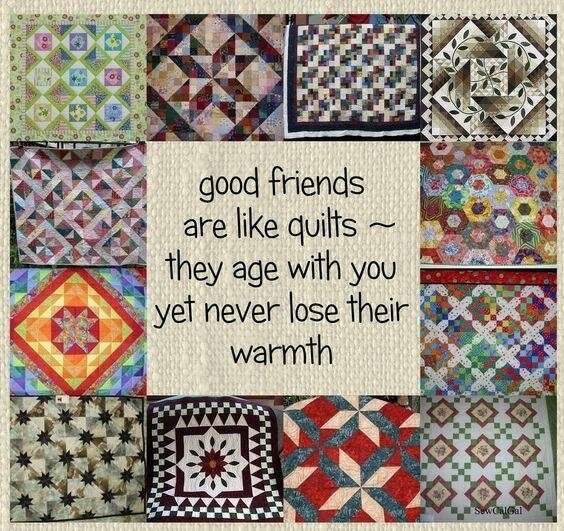 To Quilt Guild Members and Friends. For the 2019 year, at the conclusion of every project that you make, take a little of the extra material and make a pinwheel block ( a small block, maybe 2”, 3” or 4” block). Up to 3 pinwheels per project. At the end of the year, sew all pinwheels together and see all the projects for the year. I think the memories will be great! It may end up being a mug rug to a king size quilt. I am going to use half square triangle papers to make it easy, plus I am going to set up a cute box, or basket to keep the project in sight and easy to get to. I’m going to try to keep it up to date so that I don’t have a lot to do at one time. Just a quick little block will make a wonderful memory table runner, or something bigger. During our meetings we will have to report how the challenge is going. p.s. Don’t forget to make a pinwheel for the blocks we are making monthly for Guild. If you have questions, contact Judy Hilferty. There is more fabric in the house than food. "Fat Quarters" are not the heaviest part of your body. You can measure 1/4" by eye. You have a "stash" and it isn't illegal. Check out some of our favorite internet links with the internet links tab. 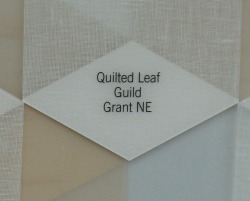 Our Quilted Leaf Guild was organized September 14, 1991. Thirteen joined then and thought it would be lots of fun. But each were ready to learn new projects and giving it a try. Seeing each one's creations cannot be beat. Not knowing the finished results until our project is done! To quilt something new - or just "catch up", I fear. And we find that the day usually ends too soon! At other meetings a member obliges - which is a blessing! Benkleman, Wray, Kearney - were among our "shop hops". Who talked and showed many quilts, and even brought her "mister"! Skills and sewing tips have been acquired. The talent seen by each member's work can be truly admired. We're grateful for the Guild, friends, years and projects too numerous to mention. Contact me if you have any additions or comments. Susan H.